Up to 60% of the human body is water – being in water should consequently be completely natural for us. However, we all know that in practice even some adults are not feeling confident in and around water. By joining our Parent and Baby or Parent and Toddler classes you will encourage your bubs natural ability to be in water. Our classes promote water confidence, mobility and basic water safety and will, with this, help you to relax in the pool together with your child. The attendance of these classes may also support other parts of your everyday life: Every bathtub session so far ended in tears and stress? There is no better way to get past this stage than with you and one of our teachers by your side. You will experience this new situation together, and the classes eventually aim to teach you how to teach your child how to be more confident and safe in water. We from Mermaid Swim Academy believe in the benefits of swimming in saltwater – from an early age. 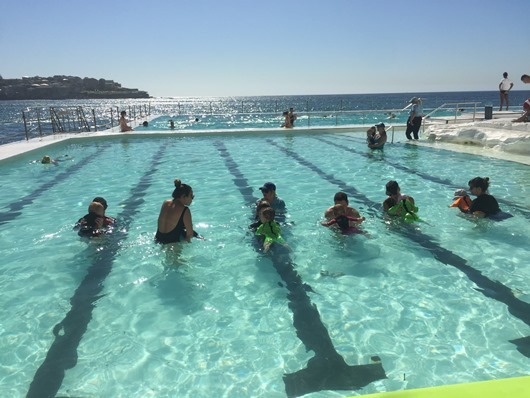 Icebergs Pool provides the perfect location to develop and practice your own as well as your bubs’ swimming skills. Taking lessons in the pool’s natural swell will also be helpful as your child can familiarise in the surf in a safe and protected environment, which is especially important here in Australia. On top of that, your child experiences a teaching environment for the first time and will, with this knowledge, be able to develop to the level of “Beginner Learn to Swim” classes quicker and smoother. This is why we encourage to start the learning process early and to continue swimming consistently. However, not only your child’s swimming skills are impacted: Different studies have shown that children who swim show more advanced cognitive and physical abilities than other children. Use this advantage and come swimming with us this season. Start early, be safer (and smarter) – we’d love to see you soon!